Harry N. Abrams, 9781419726477, 240pp. “Shea Serrano’s new book… is a hilarious, informative group of passages that answer questions you never realized needed to be asked." 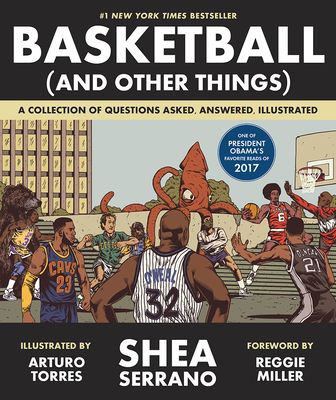 "All of the musings—the book spans 240 pages and is comprised of 33 chapters—is playfully illustrated by Arturo Torres and serves as a reminder that although basketball fans may get all riled debating GOAT status and greatest teams, the NBA, at its core, is just plain fun." "Amazing artwork by Torres adds Jack Kirby-esque crackle to the book..."